The word Physiography refers to ‘Physical Geography’. 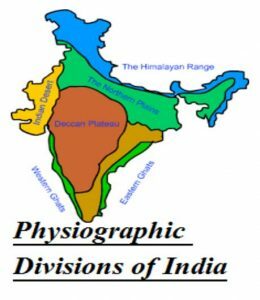 It is derived from two words “Physio” and “Graphy” which means writing facts about physical geography. These mountains are the young fold mountains which were formed during the tertiary period of Geological Time Interval. Himalayas are called fold mountains as these were formed due to tectonic collision of Eurasian plateau and Indian plateau. ‘Him’ refers to ice and ‘Alaya’ refers to home, therefore Himalaya refers to home of ice. The Himalayas possess sharp peaks and stretch over North West India to North East part of India. It carries the highest peaks in the world and is most rugged mountain barriers in the world. It includes the three ranges i.e Himadri, Himachal and Shiwalik. It is also known as Greater Himalayas or Inner Himalayas. These are the continuous mountains for 2400 km with average height of 6000 metres. ‘Him’ refers to snow and ‘adri’ refers to covered, hence Himadri means covered with snow. These himalayas carry world’s most prominent peaks and are composed off granite and perennially covered with snow. For Instance – Mt. Everest, Kanchenjunga, Annapurna, Nanga Parbat. These are also known as Lesser Himalayas or Middle Himalayas. The average height of these himalayas is 4500 metres. Since they are seasonally free from ice Hence these mountains are centre of attraction for tourist and many tourist place are located here. Pir Panjal range is the longest range of Himachal Himalayas and the most prominent ones are Dhauladhar range and Mahabharat range. These are the Outer Himalayas with average height of about 1500 metres above the sea level. Shivaliks are the fragmented Himalayas and these develop a unique geographical feature called ‘Dun’. For instance, Dehradun and Patlidun. These include three ranges i.e Karakoram range, Zaskar Range and Ladakh Range. They are located in north- west India. Trans Himalayas are also known Tibetan Himalayas. Famous peak and India’s Highest Peak K2 ( Godwin and Austin) is located here. World’s Highest Battlefield – Kargil in siachen glacier, Drass Sector is located here. It also world’s expensive battlefield. The river Indus flows between Zaskar and ladakh range.